Thanks to its record away from home, El Paso is back on the road to the Pacific Coast League Finals. 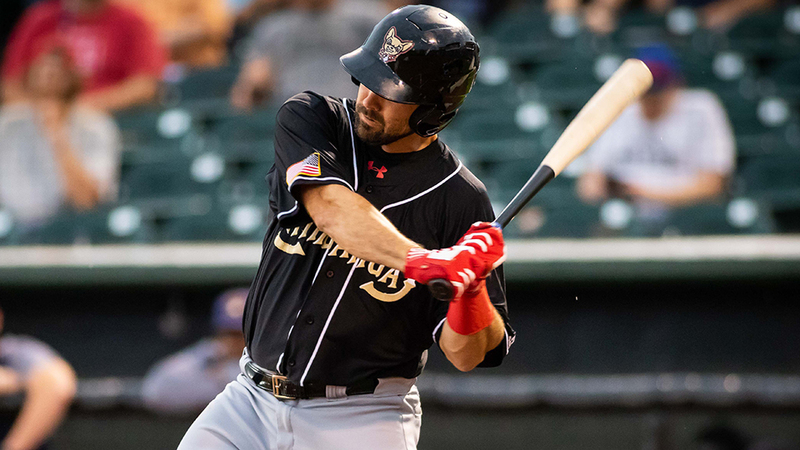 Brett Nicholas, Raffy Lopez and Dusty Coleman hit RBI singles in a four-run seventh inning as the Chihuahuas beat Fresno, 4-2, to even their best-of-5 Pacific Coast League semifinal series at 2-2 on Saturday at Chukchansi Park,. Game 5 is Sunday in Fresno, with southpaw Jerry Keel taking the hill for the Chihuahuas against right-hander Brock Dykxhoorn. It was the second straight road win after El Paso dropped the first two games at home. That's nothing new for the Chihuahuas, who were a PCL-best 45-24 away from home. "It started early," manager Rod Barajas said. "We won four of five in Vegas and on our next trip, we swept both cities [seven games at Reno and Vegas]. It's something that when we get on the road, we're really comfortable." El Paso had to rally to avoid elimination. Right-hander Cy Sneed (0-1) allowed one hit through six innings and struck out Ty France to start the seventh. But Shane Peterson doubled to right and Allen Craig went the other way for a single to put runners on the corners. Nicholas dropped a hit into center field to score Peterson and knock out Sneed. Facing lefty Kent Emanuel, Lopez lofted a single into right to score Craig and give the Chihuahuas the lead. Coleman followed with a hard ground ball to left to make it 3-1 and Javy Guerra's RBI grounder padded the lead. "I just think we needed to get that one big hit in the inning," Barajas said. "[Sneed] dominated that whole game, and we had only one baserunner before then. I think getting him in the stretch changed things and maybe he was a little fatigued. Who knows?" Colin Rea nearly matched Sneed into the sixth, allowing a run on four hits over 5 1/3 innings. Brad Wieck (1-1) worked 1 2/3 scoreless frames for the win and Gerardo Reyes retired all three batters he faced for his second straight save. Barajas credited veterans like Rea and Nicholas for their influence. "Without a doubt, those types of players, Allen Craig, Shane Peterson, they're huge, especially on a Triple-A club," he said. "I've heard some horror stories about veterans who don't mesh, but these guys have been great, especially with our backs against the wall. It's a testament to their leadership." Fresno took a 1-0 lead three batters into the game on Jack Mayfield's RBI double, but the Grizzlies did not score again until third-ranked Astros prospect Yordan Alvarez homered leading off the ninth. Game 4 of the other best-of-5 semifinal series was rained out. The teams will play two games, if necessary, on Sunday, with the Redbirds owning a 2-1 lead.